Syncs with iTunes, automatically finds guitar/bass tabs. Is there a better alternative to Tab Finder? Is Tab Finder really the best app in Music category? Will Tab Finder work good on macOS 10.13.4? 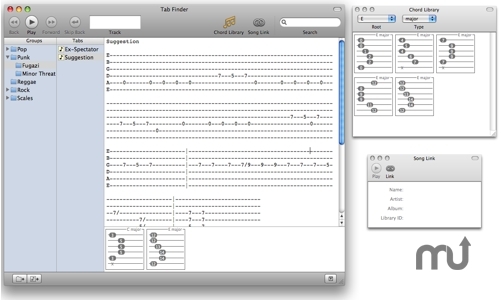 Tab Finder is a guitar tab manager with iTunes controls and chord library. Includes an extensive chord library. Chords can be saved with tab files. Control iTunes directly - play, pause, previous / next are all here as well as 'Skip back' to repeat a section of a song. Link tab files to songs in your iTunes library and tell iTunes to play the linked song. Or, have TF change to a linked tab when its song is being played in iTunes. Tab Finder needs a rating. Be the first to rate this app and get the discussion started!